Last year I presented a simple innovation dashboard with 4 parameters: pipeline, prototypes, portfolio and participation. What do these parameters measure? Pipeline: How many ideas do we generate? Prototypes: At what rate do ideas move forward? Portfolio: What is the total potential impact? Participation: Is the innovation activity likely to sustain? I want to focus on idea velocity – the rate at which ideas move forward. 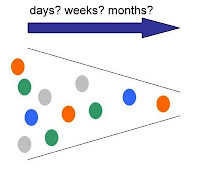 What are the different indicators of idea velocity? Let’s look at 4 such indicators below. 1. Responsiveness: How fast does the system respond to an idea submitted? In places like Boardroom Inc, a Connecticut publisher, ideas get evaluated in weekly team meeting. Many small ideas can be implemented within the team and don’t need any approval of higher authority. In Toyota, it works in a monthly cycle and uses hierarchical approval system. Small ideas get evaluated and awarded locally. In any process that takes more than a month to respond to the idea author, it is a cause of concern. In a social network with a voting system, the feedback can start very quickly. 2. Prototypes: First prototype could be a paper sketch (used by Tata Nano team), a skit depicting the usage scenario or a computer simulation model. What matters is how fast does the idea go from a concept to a prototype? And then from the first to the second and so on. First AdSense prototype was built in a few hours by Paul Buchheit. Amy Radin, Chief Innovation Officer of Citigroup, looks at: getting x number of pilots in market by y date. Google says, it performed 20,000 experiments in 2010 to improve its search algorithm and finally took 500 ideas live. 3. Champions: How many ideas have a champion? Champions are people with clout. They can push your idea through the resistance faced within the organization or outside. You are lucky when the idea champion is the group chairman (like Ratan Tata). However, more often he is likely to be a senior manager like David Patrick at IBM. Sometimes, your customer could also become your champion. For example, Lego involved selected advanced users in co-designing & championing its Mindstorm NXT. 4. Dedicated team: Any not-so-small idea can run only so far as a side activity. It needs a dedicated team, even though it could be just 3-4 people to begin with. Dedicated team is an indicator of the seriousness and attention from the management. For example, Tesco India has a problem solving track where a cross-functional team attempts to solve a chronic problem of the businesses. Rigor and rhythm of innovation reviews play an important role in making sure that selected ideas get appropriate resources. I am sure there are more or better indicators you may be using. Your input will really help me get a better view of this metric.